In Japan: Wider Evacuation Zone Urged : The Two-Way International authorities want Japanese officials to consider evacuating a larger area around the crippled Fukushima Dai-Ichi nuclear power plant because of a soil sample taken 25 miles away that contained high levels of radioactive cesium. 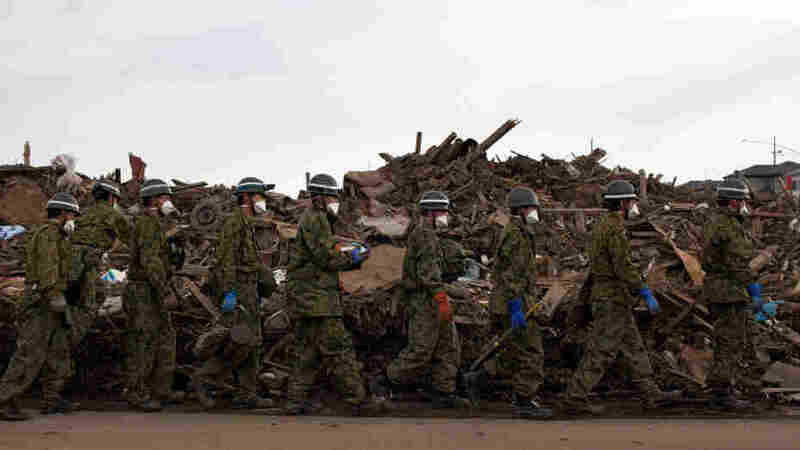 Japanese Self-Defense Force soldiers walked in a line after finding the body of a boy in the rubble in Higashimatsushima, Miyagi prefecture earlier today (March 31, 2011). There's more troubling news from Japan, which continues to struggle with the after-effects of the 9.0 magnitude earthquake and the subsequent tsunami that killed thousands on March 11 and triggered an ongoing emergency at a nuclear power plant. "New readings show radiation levels continue to rise in the ocean outside a leaking nuclear plant in Japan's northeast, officials said Thursday, as they debated whether to broaden the evacuation zone around the tsunami-damaged facility. Japan's Nuclear and Industrial Safety Agency said it was looking into a report from the U.N. atomic agency about high levels of radiation in the village of Iitate, 25 miles from the plant in Fukushima prefecture." From Tokyo, NPR's Jon Hamilton filed two reports for our Newscast. On the radioactivity detected in seawater, he says the radioactive iodine that's been detected is "unlikely to cause health problems because it degrades quickly and will become diluted as it moves away from the plant." Still, he says, its presence suggests "that a significant quantity of contaminated water ... is finding its way to the ocean." On the radioactivity in the soil, Jon says "the sample contained enough radioactive cesium to raise the risk of cancer if a person were exposed for a long period of time." It is, though, just one sample and others taken nearby have shown lower levels, Jon reports.